With the new design of my blog, there are a couple new things that have been added. For example list building through this blog is important. I tried to make sure there are optins everywhere, even making them simple. One simple adjustment I did was adding a plugin which adds users to my aweber list with just the Facebook Application platform. If you have not yet seen it, there are several aspects where I present this on my blog. The more prominent one is when you are just about to leave my blog, an overlay will present you with the ability to download my affiliate guide. Essentially it is just a click gesture which is faster than typing in your email address. I also have my Facebook Connect Application on my landing page for the affiliate guide as well with the option to utilize a traditional webform. All the end user have to do now is click on allow. Simple and they are then subscribed to my blog mailing list. The email address of the user from Facebook is worth more than a traditional optin email address because of its authenticity. A user with a Facebook profile is probably using their real email address and the one they check regularly. This method proved to be the best way for me to gain more optins from this blog. The plugin that I used for this is called WPSubscriber. It is a very thought out plugin which has a ton of options to get users to subscribed to your mailing list. I found after I implemented this plugin my optin rate quadrupled my daily traditional short form optins. Truth. WPSubscribers is definitely a great plugin to utilize when trying to leverage users on your blog. It is a very simple plugin to use, but it is also pretty advance as well. For example the Facebook Connect Application part of WPSubscribers took me a while to figure it out. I needed to email the creator of the plugin to get some assistance and they helped me fairly quickly. Great support on their part. With using Facebook Applications, you are actually creating an app (hence the name) for the user give you access to their information. This allows you to retrieve their email address and name after they have verified your app within Facebook. This is why I added my caricature picture and the text Ian Fernando Blog, giving assurance to the reader. You setup your WPSubscriber plugin after you setup your Facebook App within Facebook. 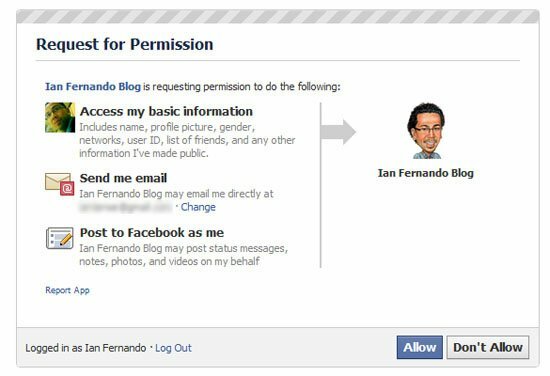 Once you setup your application in Facebook, you just input the credentials into WPSbuscriber and you are ready to increase optins. There are also many uses I use this plugin for (maybe another blog post), but mainly to get the attention of my blog readers and giving them a benefit of the download. I also do not let the popup happen when the user enters my blog. I personally find that annoying. Instead I let the overlay popup pop when the user is about to leave the blog post. My train of thought is this, if someone enters my site they are here with interests to read my blog post or see some pictures. Quickly prompting a blog reader to subscribe increases time on site stats, because of the form redirect, and it also breaks their patience. They enter your blog to receive information, if they are done you can prompt the popup to provide more information. Which is why I have set my WPSubscriber to set when the user is about to leave my blog. Maybe worth a test? There are a lot of these popup scripts out there, but WPSubscriber is definitely worth the investment as there are so many uses for it. With so many features such as footer optin boxes, header optin boxes, display hidden content, registration subscription, analytics, etc. There are literally a lot of options and features within this plugin. As I stated earlier this plugin is easy to use but it can also be complicated when you want it to be. With so many uses you can start increasing your optins from your blog pretty quickly and overnight. Next articleCreate a Landing Page Quickly, Point and Click!